1-800-MICE is a sprawling and surreal soap opera concerning the fate of Volcano Park, a “seething interspecies metropolis” of the nearish-future populated by humans, evolved animals, and a ruling caste of sentient trees. Volcano Park is in peril – plagued by authoritarian cops, a violent gang of dandy criminals peddling designer drugs and mass oblivion, and a blossoming class-war that threatens to unravel the already-tenuous threads holding the city together. To make matters worse, a mysterious meteor is now racing toward earth. We topple headfirst into a web of political intrigue and cultural warfare fueled by unhinged psyches, fetishistic eroticism, corporate paranoia, cyber saturation, and new age quackery led by a slew of villainous interests – Aunty Lakeford, The Great Partaker, and the LA Shogun, former bandmates competing for their immortalities and cultural dominance, and Doctor Vial, a cult leader and drug kingpin of the arboreal drug known as Creosote. These megalomaniacs threaten to bring about the apocalypse of Volcano Park and existence as we know it. Can this diseased city be saved before its mass annihilation? Can anyone be saved? Featuring Nina Kearin, Jacob Zabawa, Carly J. Bales*, Dave Iden*, Martin Kasey, Suzie Doogan, Alexander Scally, and Philip Rogers. The third play of our 2016 – 2017 season directed by our Founding Artistic Director, Evan Moritz. Prospero – a sorcerer and former Duke of Milan – and their daughter Miranda have managed to survive and thrive on a remote island for twelve years after being exiled and left to die by Prospero’s treacherous brother, Antonio. 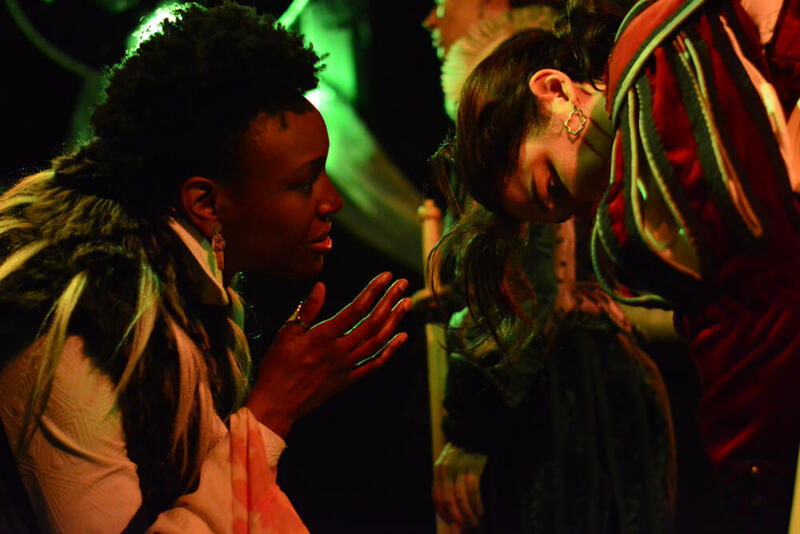 Prospero becomes obsessed with avenging their name and bringing their daughter to her rightful place in society. Conjuring a violent tempest on the waters, they are able to entrap a ship carrying Antonio and a court of Neapolitans. The ship wrecks on this island that rests between galaxies – somewhere between the rational waking world and the magic dream world. Inhabitants from both these worlds collide as Prospero is forced to confront their past life and conquer their deep-seated lust for vengeance. The city was grey, and had been for months. A string of disappearances, all lower class youths, leads one young citizen, desperate to find their sister, into the office of former Missing Persons Deputy Bridgette Miakowski. The Shattering Frame, an original detective noir, will bound Miakowski’s past and this young citizen’s future together in a mystery that goes all the way to the top. SIMAETHA is a Dreambaby cabaret written and performed by their alter-ego Jacob Budenz. SIMAETHA explores the cultural role of the witch as a way of re-mythologizing the self. The performance becomes part ritual, part cabaret arising from memories real and conjured – childhood escapades with a family ghost, conversations with luckless tiny-town maidens, summonings of the demon of lust – that Budenz weaves together with poems, stories, spells, found songs with original arrangements, and borrowed rituals. DAD JOKES is the second Knee Play of the Annex Theater season. Emily Hall was most recently seen in Stupid Ghost at Annex Theater and directed the sold-out run of Cook/Thief/Wife/Lover for Annex in 2014. Anthony, in his sixties and native to Baltimore, is determined to make a better life for himself. He’s seeing a therapist, kicked drugs, and applied for Section 8 housing. For now he’s squatting downtown, and trying to take care of himself, the abandoned building, and a coterie of friends who depend on him. In the face of poverty, addiction, abuse, gang violence, city mismanagement, and the biggest snowfall on record, Anthony shoulders the weight of his friends’ survival. Told through first-hand accounts interwoven with myth and history, urban and magical realism, tragedy and absurdity, Anthony advocates for himself and the Baltimore homeless community–knowing all the while that not everybody makes it.